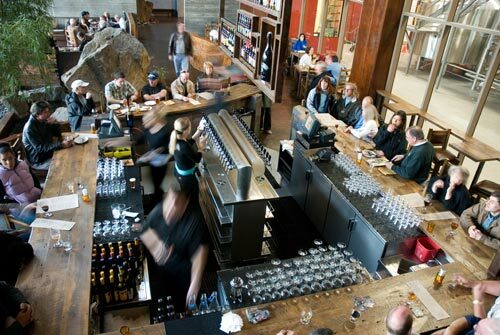 Feb 21 Tell it Tuesdays: Stone Brewing Co. Interior Swag: Amazing place! Vast space, tall ceilings, urban décor, stonework, wood detail and a view of the 55,000 square foot brewery on site. 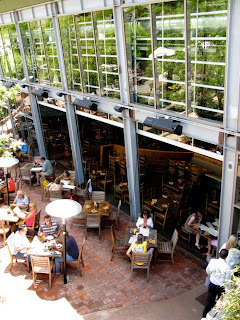 The large windows open up onto an outdoor patio overlooking a garden, waterfall and pond. Very impressive. Service: Cute, young Austin was very attentive and friendly. Food & Drink: The Stone Brewing Co. World Bistro and Gardens prides itself on using the finest in fresh, locally-and naturally-grown ingredients. We shared a light lunch consisting of a delicious garden salad and crostinis with hummus. 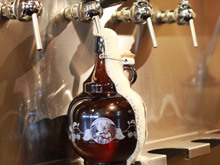 They sell growler jugs that you can have filled fresh off the tap with any of their year ’round releases to take home. Go-Back-Again-Ness: I’d love to take my dad. This place doesn’t feel like a bar, and definitely doesn’t serve “bar food”. Perfect for a Sunday lunch.